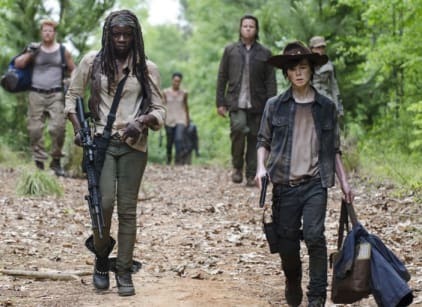 The survivors begin their new journey, away from Terminus. They come across Father Gabriel, who was about to be eaten by walkers. He reveals that he has killed no people and no walkers, and he lives in a church. Rick doesn’t trust Gabriel, but Carl says there are people out there that are good. Abraham is ready to get going, but Rick, as the leader, says the group will stay to rest up and resupply. Rick takes Gabriel and a few others to get more canned food. While fighting off walkers, Gabriel freaks out. Bob is attacked by a walker. The group feasts together, happy, before they all decide they should head for Washington, D.C.
Tara admits to Maggie that she was with the Governor. Daryl and Carol, while out at the car they found, see a car that looks like the one that took Beth. They go after it. Bob looks fondly on the church before crying against a tree. But someone knocks him out. When Bob comes to, Gareth and his Terminus people reveal they are going to eat him and already have begun to.